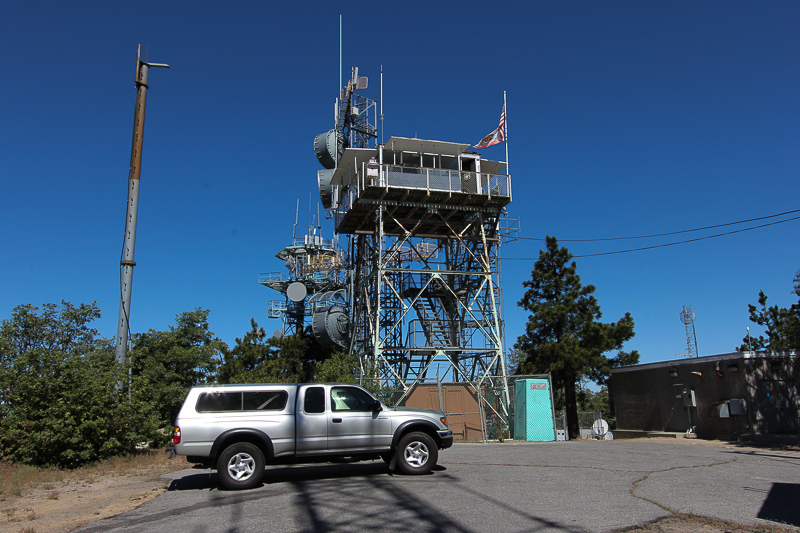 June 5, 2014 - Today we drove up into the mountains to see the Strawberry Peak Fire Lookout in Rimforest, CA. 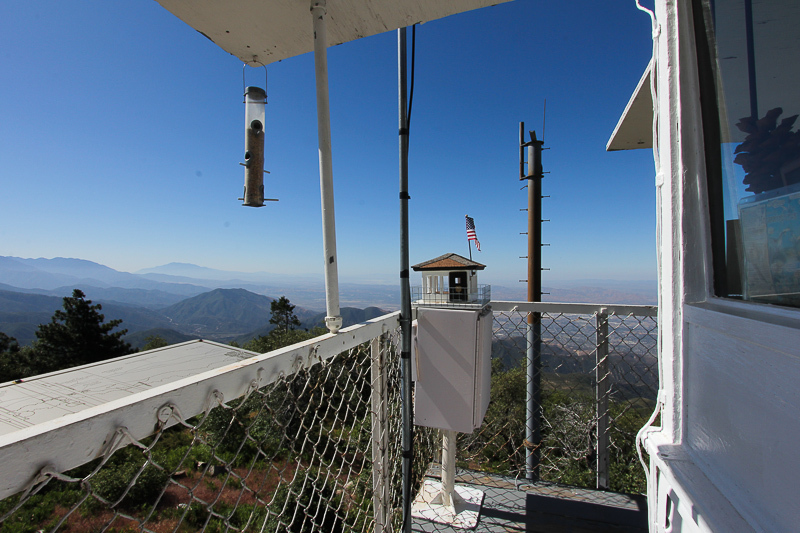 On October 25, 2013 we visited the Keller Peak Lookout in Running Springs, so this made our second visit to the seven lookouts guarding the San Bernardino National Forest. 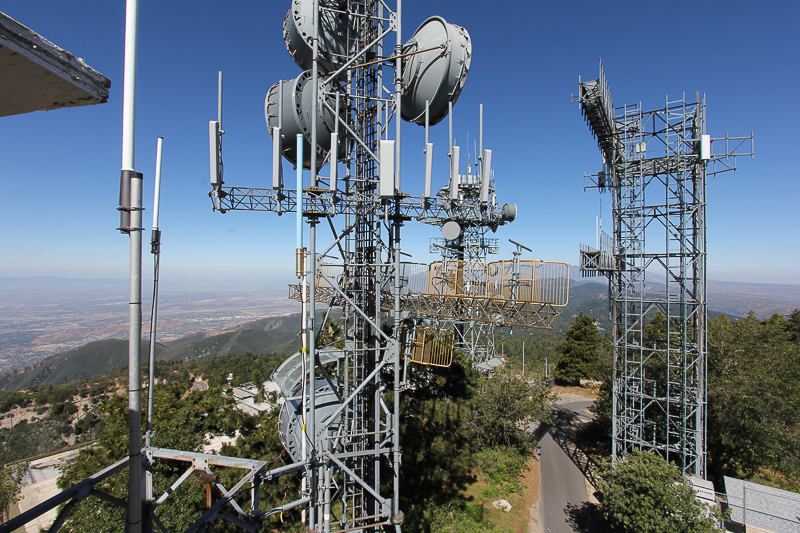 The peak is loaded with communication towers and equipment. 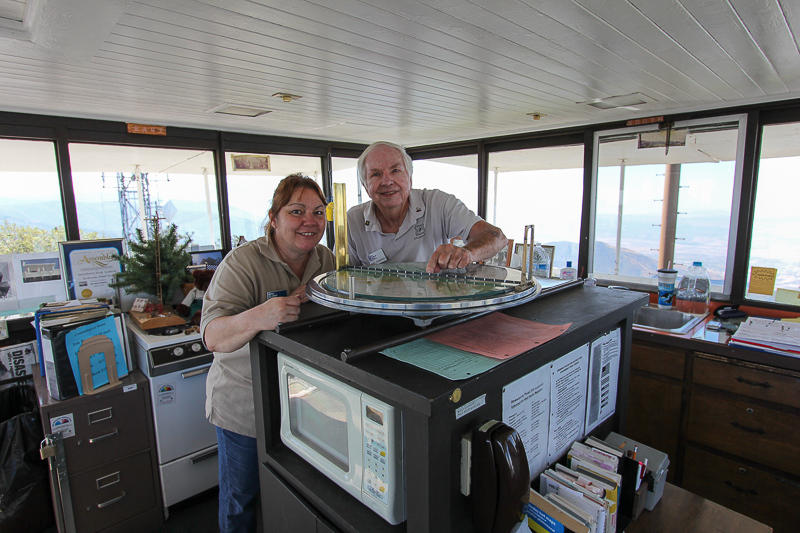 Sheila and Ken were the volunteer lookouts on duty today providing us with an orientation and some of the history of this particular lookout. Here they're demonstrating the Osborne Fire Finder for us. 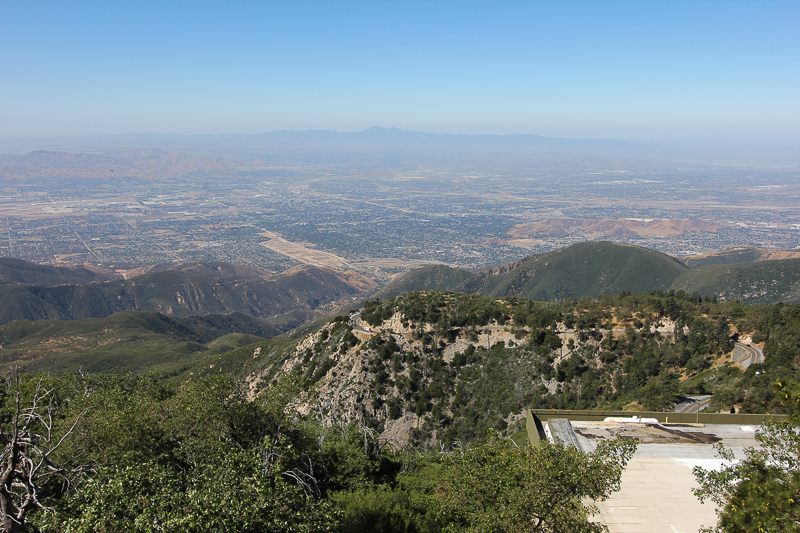 Majestic views, solitude, quiet, heroic vigilance—the seven fire lookouts of the San Bernardino National Forest capture a romantic part of California’s past. 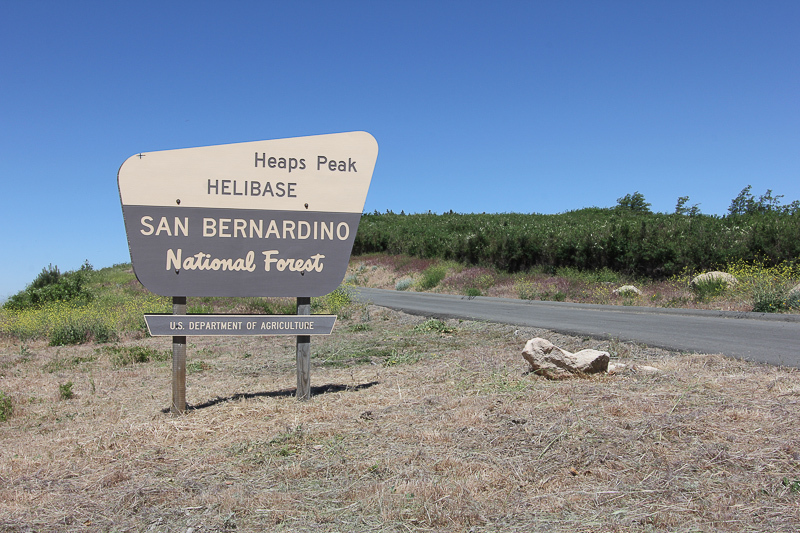 Ken mentioned that there is a U.S. Forest Service helicopter base a few miles away so we headed toward Running Springs and easily found it. 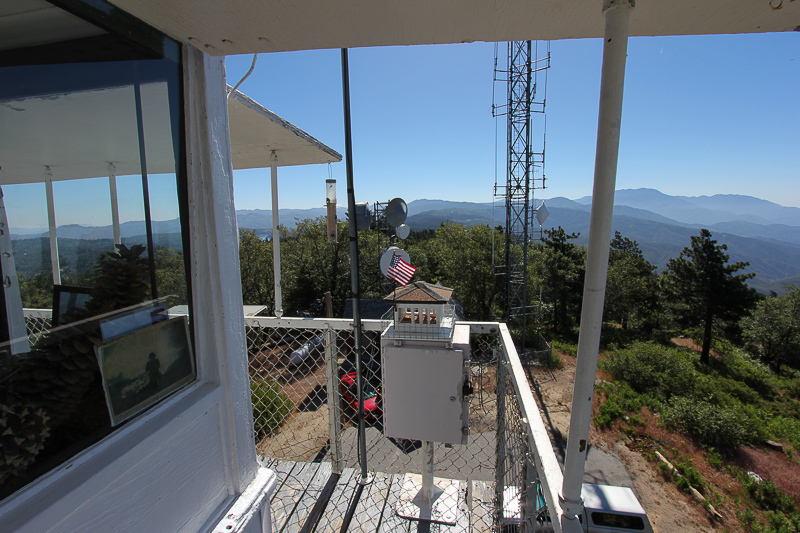 Though the sign says "helibase," this station is now called a "helitack," for "helicopter-delivered fire resources." When we arrived at Heaps Peak Helitack, we luckily found ourselves a great show. If I had to bet, I'd say that this saw can quickly fell a fairly large tree, assuming the two persons handling it knew what they were doing. 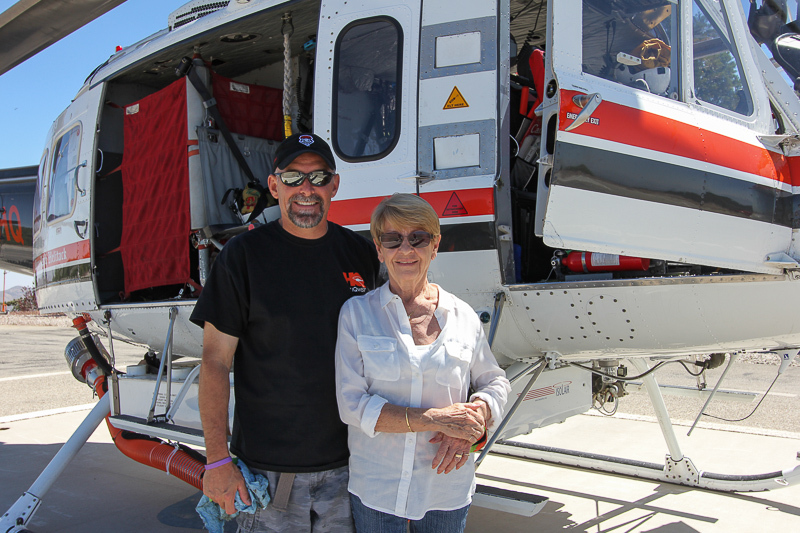 The star of our impromptu tour was this 1971 vintage Huey helicopter (Bell Huey). 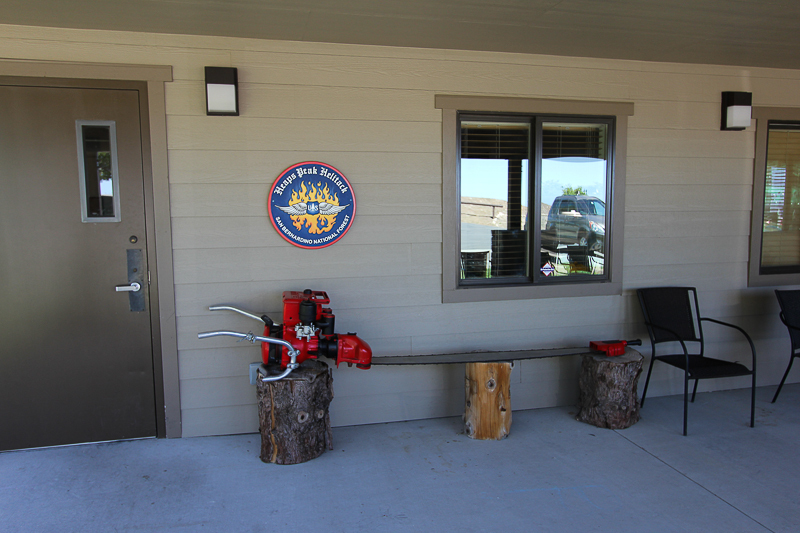 Nine firefighters sit in the cabin that Judy is in and all of their gear is stowed behind them. 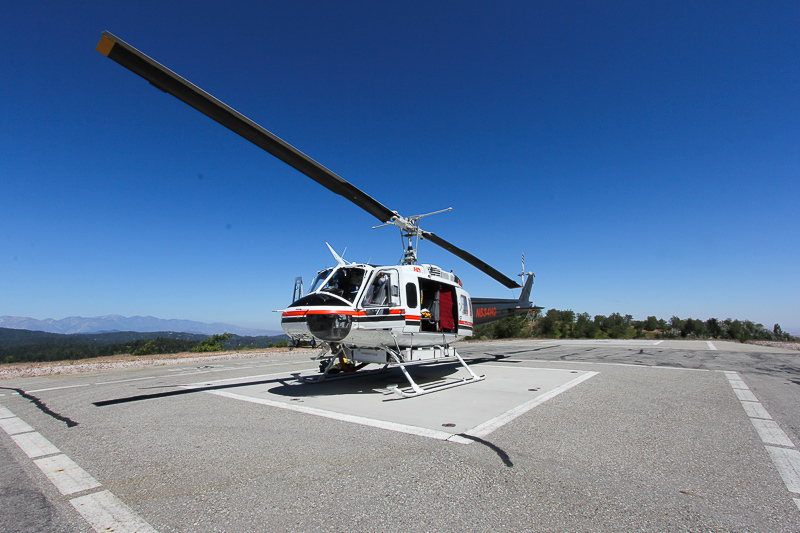 Notice the orange hose beneath the helicopter with the stainless steel fitting at the end. 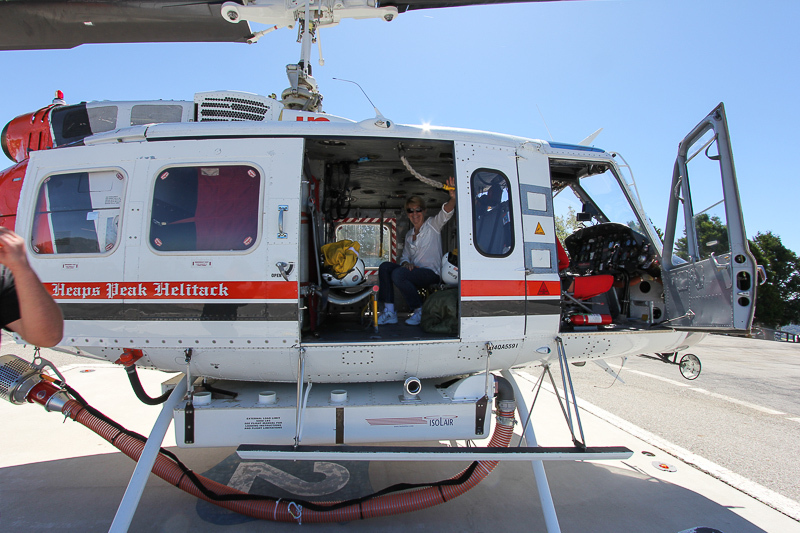 That's called a "snorkel' and the pilot hovers over a water source to fill the 400 gallon Isolair tank in 30 seconds. I was lucky enough to sit in the pilot's seat. 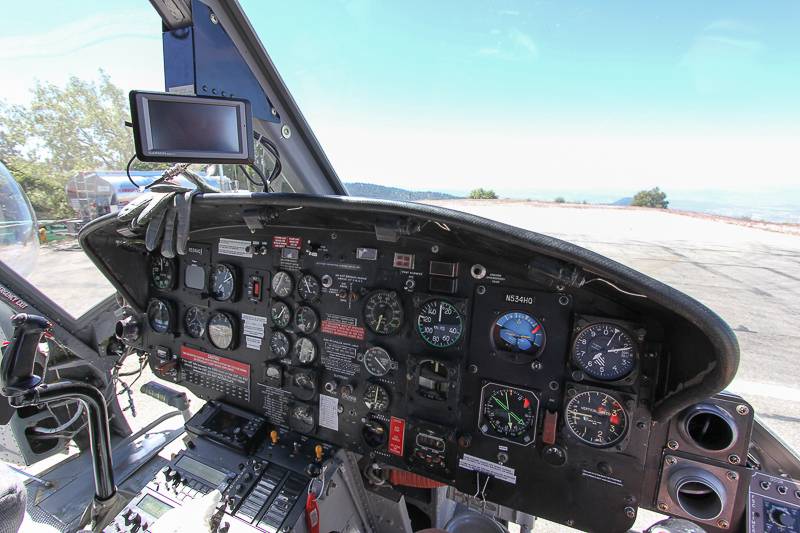 This is the pilot's view out the front. 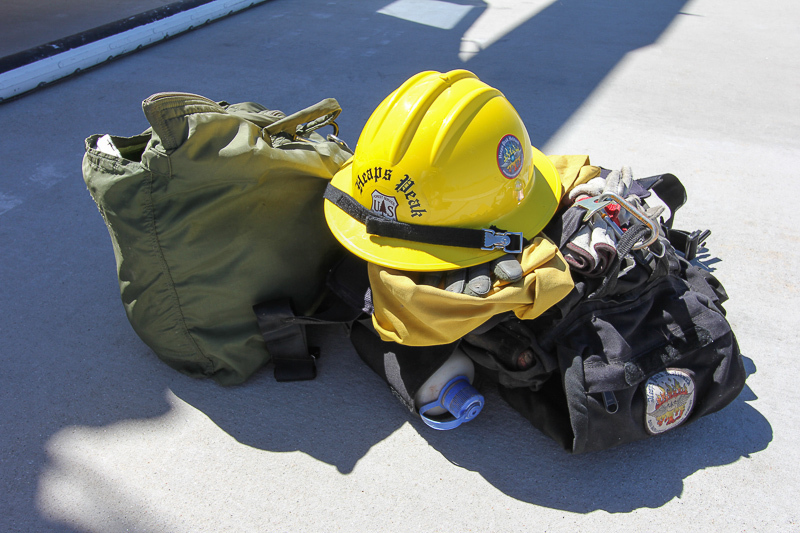 The firefighters had packed their gear and they were in the process of stowing it onboard. 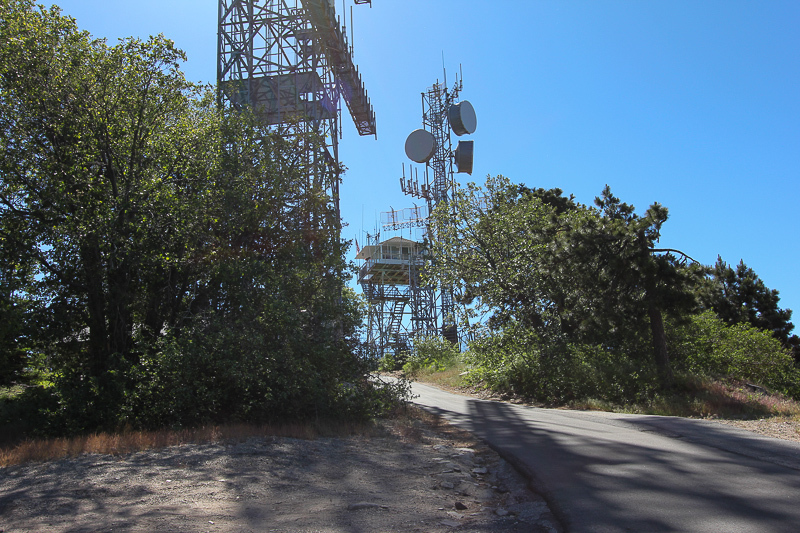 They completed the operation while we were there and they were now at the base and waiting for their call to action, which could occur at any time. The pilot of this ship is a great guy named Earl, who works for HeliQuest. 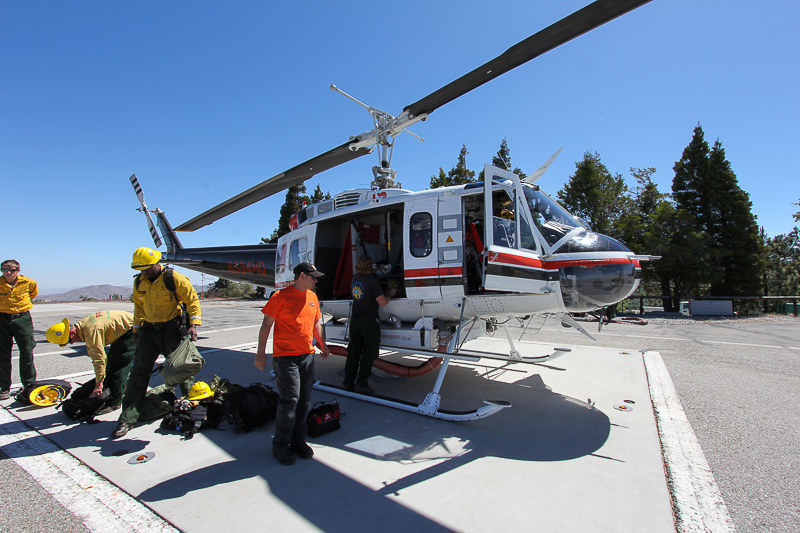 HeliQuest is contracted by the U.S. Forest Service for this and other helitacks around the country. 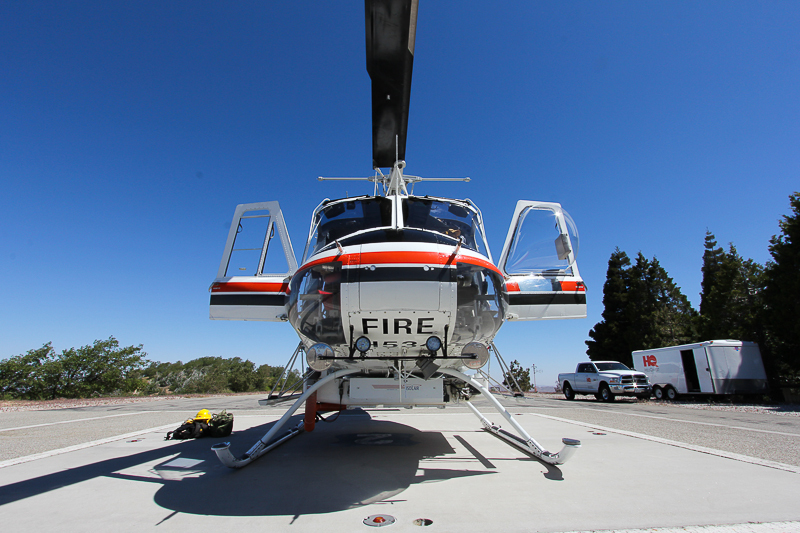 HeliQuest supplies the pilot, a mechanic, the helicopter and a fuel truck and driver for the Heaps Peak Station during the 160 day fire season. Judy asked Earl what got him into this business that literally takes him all over the world. 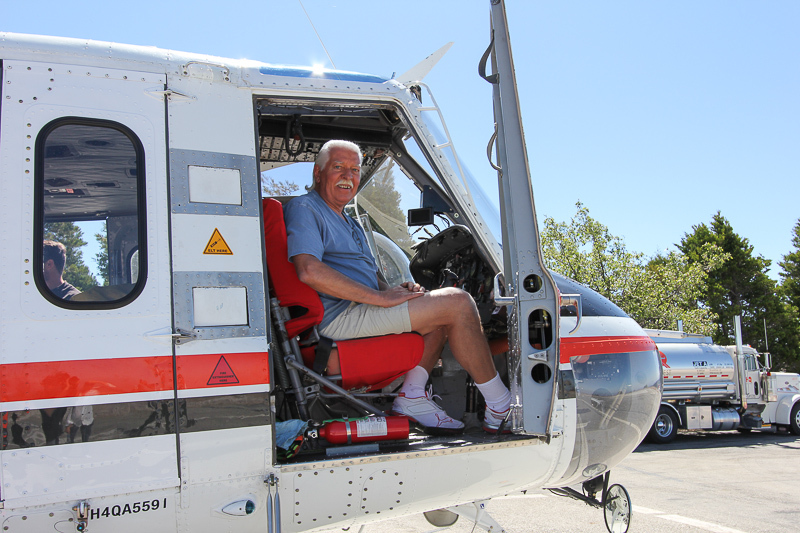 Earl said his dad flew a Huey when he was in Vietnam, and as soon as Earl got out of school, he was flying them as well. Thanks Earl, and all of the Heaps Peak crew, for a very informative tour. Since we were in Running Springs, we stopped at Rocky's Roadhouse for lunch. He really is the sandwich maestro!